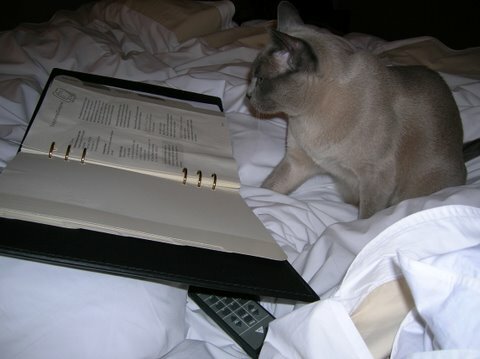 But my thoughts are on Maine…we are planning our first 2011 Maine getaway…so…the above photo is Lucy perusing the room service menu at the Mariott in Portland before heading on to Camden the following day. We had great plans to go to dinner at one of our favorite Portland restaurants…Street And Company…local bistro…amazing fish…the best ever blueberry crisp…but as we walked out of our room…we stopped to listen to make sure Lucy was content…and she began screaming…either she knew we were right outside or she knew she was being left for a few hours. Lucy is a Tonkinese with one of the loudest wails you have ever heard. So…we gave up, walked back into our room and all three of us ordered room service. What is on your mind this cold snowy Saturday? How fun! I live in Maine…And love it here! My husband and I are actually planning a romantic getaway to Portland for next weekend…We're going to the Merrill Auditorium to see the Blue Man Group. We're staying at the Hilton Garden Inn and I'm planning on a dinner at The Corner Room (yummy!) and Sunday brunch at Duck Fat (not for the faint of heart–literally). I hope you enjoy your time in our beautiful state!! Patty-I applaud you for loving your winter, and snow…you, and my sister in Southern Ohio…outskirts of Cleveland. They are so snowed in that they gave up shoveling their driveway, so they've been staying indoors a lot. Good thing my B-in-law is retired now, so they don't have to venture out much. They too don't complain about the brutal winter there! Lucy knows what she wants!